Abstract :- This is a very effective exercise monitoring system and can monitor walk or run of user. In this project ATmega644 microcontroller is used for controlling. With an increase of the number of health conscious individuals hoping to remain fit, we designed a system that allows the user to keep track of his or her total number steps, current speed, and total distance in both real time and with a data logging system. This is especially useful for any students who are concerned with how much exercise they are getting by simply going to class! 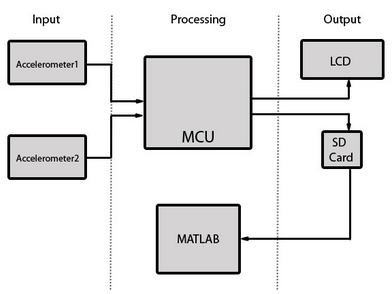 The structure of this design centers around the ATmega644 and its three peripherals, namely the accelerometer, LCD screen, and SD card reader with MATLAB plotting. The peripherals can be divided into two broad categories of function: data input, and data output. As can be deduced, the accelerometer system was used for data acquisition, and the LCD screen and SD card were used to log or present data that would be meaningful for the user in real time or for future use. The main hardware design of this project consist of the main microcontroller, communicating with its 3 peripherals (LCD, accelerometers, SD card). Since none of these peripherals are extremely expensive or computation heavy, the main difficulty lay in software tradeoffs. Since the entire program was run using the TRT scheduler, how much time before the next release and deadline for each task was important in determining the tradeoffs between user experience and total data logged. Programming of this project is written in C using the Atmel MEGA644 with AVR Studio. Additional code was written in a simpler MATLAB script to load data from the SD card and plot it. This is a good innovative project for final year Electronics students.